To build a high performance organization, a strong accountability mindset and practices must be embedded into your company’s DNA. The two combined catalyze your organization to move from struggle to thriving, from crises to momentum, from inertia to growth. Below are my top 10 most important leadership and culture practices necessary to make that leap. 1. Set goals that truly motivate and excite your employees.The first step to a strong accountability culture is to set goals across the entire organization. However, nice sounding goals on paper does not guarantee achieving them. 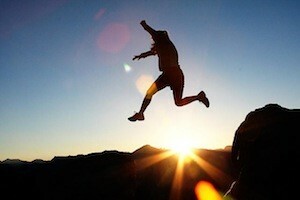 Most leaders overlook the missing ingredient that drives achievement — MOTIVATION. Employees must be motivated to “want” to achieve their goals. Below are a few ways to help your employees set goals that they want to achieve. Establish goals that challenge them. Studies have shown that difficult goals result in higher levels of performance than easy goals. Elicit each employee’s personal goals and find a way to help them achieve personal aspirations in conjunction with their workplace goals. Help employees identify their jobs’ essence – ie: the higher purpose of why that role exists – to appeal to their fulfillment needs. 2. Define outcome or results-based job descriptions that align with company goals. ‘Old style’ skills and competencies job descriptions are poor predictors (or motivators) of future success. To truly drive results though your people, every leader and employee should have a results-driven job description that identifies their top 3 -5 outcomes, along with clearly defined success measures to be tracked throughout the year. I also include a more comprehensive set of important factors, when working with leaders, such as: critical success factors; connection to company goals, resources needed; shared vs. sole responsibility; action plan; and what factors could derail achieving the outcomes. 3. Hire for attitude and motivation; teach the skills. A recent study showed that almost 50% of new hires left in the first 18 months. Of those, 89% left because of ‘attitude fit’ issues, while only 11% left because of lack of skills. 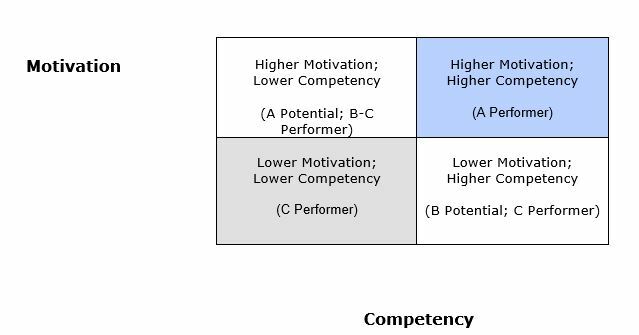 The below table illustrates the tradeoff of hiring for motivations vs. competencies and the level of performance you can expect. Hiring for motivation and attitudes over skills is critical to build strong accountability and high performance. 4. Make sure your employees have the necessary skills/competencies, tools and resources to succeed in their role. While the predominant drive of performance is motivation, having the necessary competencies and tools are essential for an employee to act on his/her motivation. If a role is “too big” for an employee – ie: they lack the skills to succeed, then it is essential to teach, coach and train your employee so they can achieve their goals. In your employee’s outcome based job description, identify the skills to succeed, where the gaps are and a development plan to eliminate those gaps. 5. Set clear expectations that your employees understand and agree to. While leaders often understand the need for clear expectations, many overrate their ability to deliver on the level of clarity needed. Because of differences in perceptions, language and the meaning given to it, too often a leader’s intended communication is not received or interpreted by their employees in the same way. This is the #1 reason for unmet expectations. Communicate expectations in concrete terms – ie: answer all calls within 3 rings. Ask employees to repeat back what expectations they heard. 6. Elicit employee’s emotional buy-in for trust and commitment. For many leaders, developing a strong accountability organization can be harder than it seems. The common blind spot is not getting your employees’ emotional buy-in about the importance of accountability. Buy-in involves capturing the hearts and minds of your employees to take ownership of their roles AND to take ownership of company results. …only 10% of their employees fell into the “Buy-in” category, while 84% were seen as either “Comply and concede” or “Exempt and excuse” in terms of owning organizational results. When employees buy-in, they act as though your company is their company. They go beyond the expectations of their role and do whatever it takes for the company to succeed. How many of your employees would fall into the “Buy-in” category and take ownership of your company’s results? 7. Reward your employees — on their terms — to increase motivation, drive and commitment. There are 2 kinds of motivation – intrinsic and extrinsic. Most companies attempt to motivate employees extrinsically – ie: compensation, bonuses and benefits. Yet Herzberg – top motivation theory expert – found that extrinsic motivators fall into the category of “hygiene” factors and can only eliminate employee dissatisfaction. They don’t increase motivation. On the other hand, intrinsic motivators – such as, achievement, meaningful work and recognition – cost little and have the greatest impact on employee commitment. As a leader, do you know what the intrinsic motivators for each of your employees are? How much time do you focus on increasing those motivators? 8. Be firm and let go of consistent under-performers. Consistent under-performers lower the entire organization’s performance. They become a de-motivating factor to other employees. They consume more of a leader’s/manager’s time when it can be better spent on your high potentials and future leaders. The first step to improving this situation is to realize that you, as a leader, are part of the problem by avoiding the truth. Do what you can for a defined period of time to coach your under-performers to achieve success. If improvement is not achieved, the second step is to help the employee to transition to a better suited role or another employer. 9. Create a daily environment and culture of self-responsibility, self leadership and self-learning. Self-responsibility is the ultimate trait of a high performing organization. You can’t have a strong accountability culture without every leader and employee taking responsibility for themselves, behaviors and outcomes. Self-responsible people are the do-ers of the world, not the “done to.” They refuse to see themselves as victims. They believe that they are in charge of their own destiny. They are the creators of opportunity, rather than believing they are entitled to it. Commitment – a willingness to do whatever it takes to succeed. Ownership — taking ownership for all your results. Continuous learning – learning from past experiences and mistakes, always seeking to grow and evolve. 10. 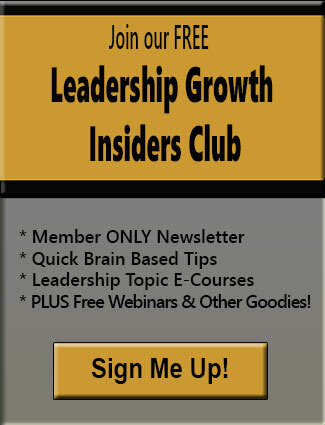 Expand your internal locus of control to drive bigger and better outcomes. A person has either an internal or external locus of control, depending on to whom or what they assign responsibility for what happens. External locus equates to a “victim” mindset. Such people believe that everything happens to them. They are masters of blame, helplessness and low self esteem. Nothing is their fault. Internal locus equates to “the accountable person.” Such people believe they can control or influence the outcomes in their lives. Even when events are beyond their control, they know they have options how to respond to such events. They have self-confidence and a learning mindset. To increase your internal locus, recognize the fact you always have choice. Brainstorm other options, take small actions and, most importantly, pay attention to and change your negative self talk. The goal of this 3 part series is to increase your awareness about the one thing. In this crazy busy world of business, I know the one thing that makes the biggest difference in you and your organization is the level of your game. Becoming an accountable leader is the catalyst for transforming your untapped potential into hard-core business results. You can only change the level of your game if you are rigorously honest with yourself about the strength (or lack) of accountability, within your organization. Use the principles and practices in this series to get started. For more personal feedback about building a strong accountability culture, request our complimentary Leadership Strategy Session to define next steps, given your goals and challenges. However you proceed, take the next step now! Posted by Denise Corcoran on October 1, 2013 in Accountability, Alignment, Company Culture, Employee Engagement, Leadership Development, Leadership Performance, Organizational Performance, Organizational Transformation and tagged A players, accountability, attitude, buy-in, competency, culture, expectations, goals, Hertzberg, job description, leadership, mindset, motivation, organizational performance, self-responsibility.